You'll be £16.99 closer to your next £10.00 credit when you purchase Crete. What's this? The invasion was launched to round off Hitler's Balkan Campaign against Crete in May 1941. The Island was important to Britain's control of the Eastern Mediterranean and Churchill was determined that the Island would be held. The British garrison was largely made up of New Zealand and Australian troops who had been evacuated from Greece, with little more that what they stood up in. On the other hand the German Commander, Kurt Student, had overwhelming air superiority, which negated the Allied naval superiority. But the Germans had almost fatally underestimated the number of Allied troops. While British, New Zealand and Australian soldiers, however, showed what they were capable of, the battle for Crete was eventually won through sheer nerve, the confidence of the German soldier in his superiority and the power of the Luftwaffe. That said, the cost in killed and wounded was such that Hitler would never again contemplate another large airborne operation. 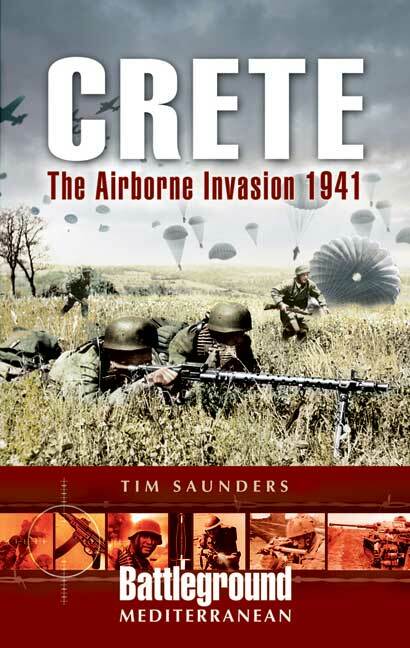 Tim Saunders continues in the fine tradition of the acclaimed "Battleground" series with a very concise and comprehensive account of the exclusively airborne German invasion of Crete. As such it is much more than a mere pocket battlefield guide, and lavished throughout with photographs, maps and many first hand accounts, it packs a considerable amount of detail into a small space and is a superb introduction to this operation. The book describes the strategic position in the Mediterranean in 1941 and the prominent role which Crete played, before discussing the British tactics for its defence and the bold German invasion plan. Several chapters are devoted to the chaotic battles which raged around the drop zones, going on to describe the key engagements which followed inland and the eventual Allied evacuation.